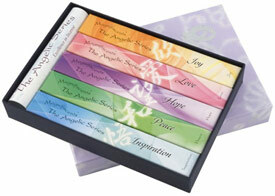 This gift set contains one bundle each of Inspiration, Peace, Hope, Joy and Love incense from Shoyeido's Angelic line, neatly packaged in an exquisite shimmering lavender and white box. This gift set contains one bundle each of Inspiration, Peace, Hope, Joy and Love neatly packaged in an exquisite shimmering lavender and white box. Box dimensions: 4 3/4" x 6 3/4"